Welcome to our village. Shirley is a small community of 250 people nestling in the folds of the beautiful Derbyshire Dales. It is a mostly agricultural environment, being an estate village from the middle ages, but since the war has also become the home of people working in nearby towns as well as a for many retired people. 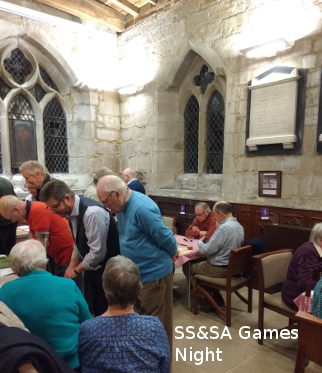 We have a number of interesting buildings dating from the 17th and 18th centuries which are still inhabited, a 14th century church which has within it a useful community space, and an 18th century pub where fine food is served. It is a centre for walkers as there are many trails through farmland and woods available to all, and we are on SUSTRANS Route 1 from Dover to The Shetlands. Horseriding is available from local stables and we have a well used Sports Field. Shirley is an excellent centre for exploring this beautiful part of England. We are centrally placed for visiting Alton Towers, Buxton, Chatsworth, many local National Trust properties, and there is a racecourse at Uttoxeter. A country gastro pub where traditional meets contemporary food. 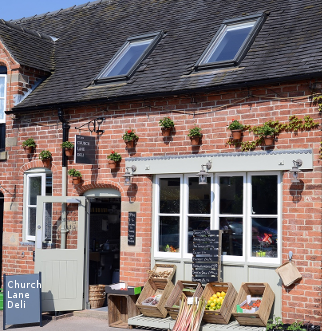 Renowned for it's fresh, homemade modern English food, made using the best local, seasonal ingredients. The minutes of the ordinary meeting held on Monday, 11th March are available on the parish council page. 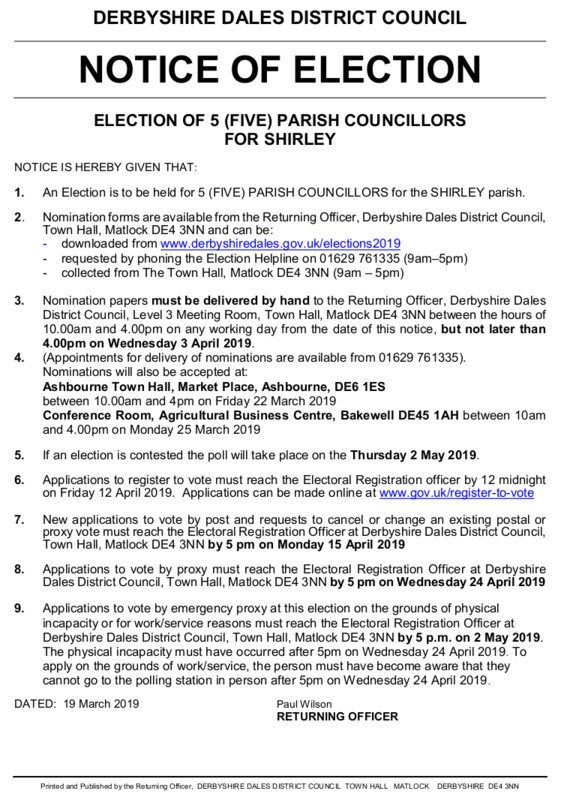 All parish seats will be up for election on 2nd May and those who wish to stand can download nomination packs from the Derbyshire Dales District Council website at www.derbyshiredales.gov.uk/elections2019. 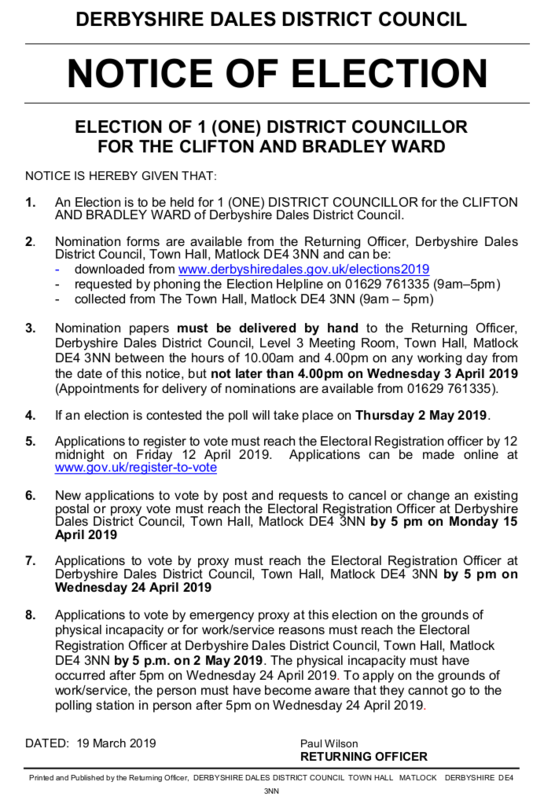 Nomination papers must be delivered by hand to the Returning Officer, Derbyshire Dales District Council, Level 3 Meeting Room, Town Hall, Matlock DE4 3NN between the hours of 10.00am and 4.00pm on any working day from the date of this notice, but not later than 4.00pm on Wednesday 3 April 2019. (Appointments for delivery of nominations are available from 01629 761335). Planning application 19/00336/FUL – Proposed extension to agricultural storage building – Agricultural Shed Adj. Bridge Cottage Shirley Common Shirley Derbyshire. Has been received by the parish council. The Parish Council would like to thank all litter pickers. chauffeurs, cake/scone makers, tea providers, washer uppers and other helpers. Your help and hard work to keep the village looking clean and tidy is very much appreciated. Contact the parish clerk to have your notice appear here.